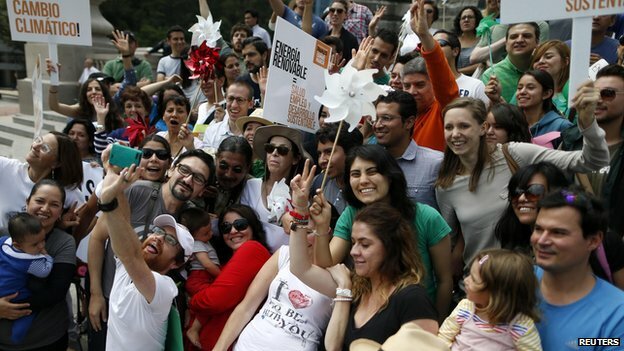 In Rio de Janeiro, some 5,000 marchers turned out. 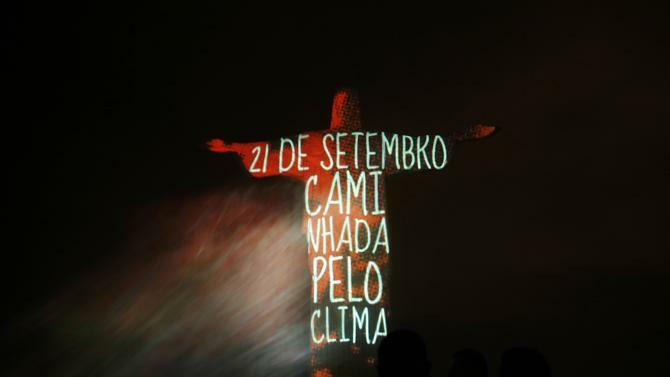 Environmental slogans and a green heart were projected onto the famed statue of Christ the Redeemer, overlooking the city. Smaller protests, attracting numbers in the hundreds or low thousands,were also seen in cities such as Bogota, Barcelona, Jakarta and Delhi. 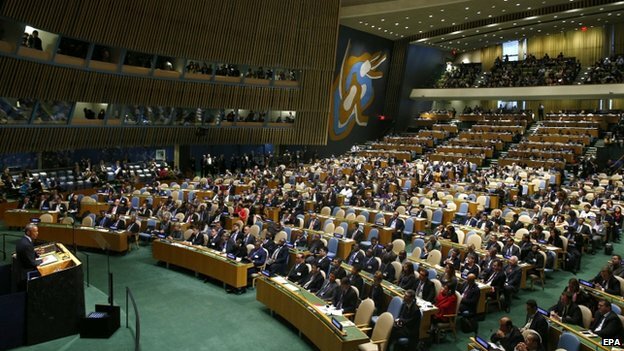 On Tuesday, the UN will host a climate summit at its headquarters in New York with 125 heads of state and government - the first such gathering since the unsuccessful climate conference in Copenhagen in 2009. 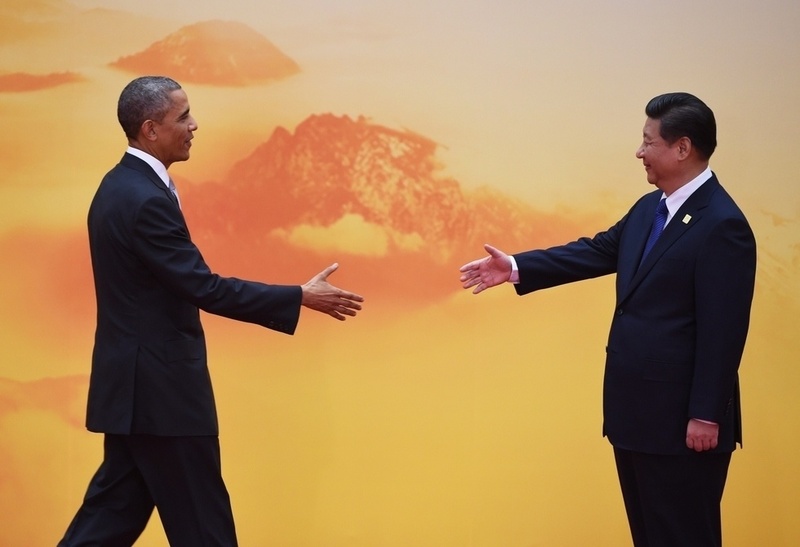 Mr Ban hopes leaders can make progress on a universal agreement to be signed by all nations at the end of 2015. 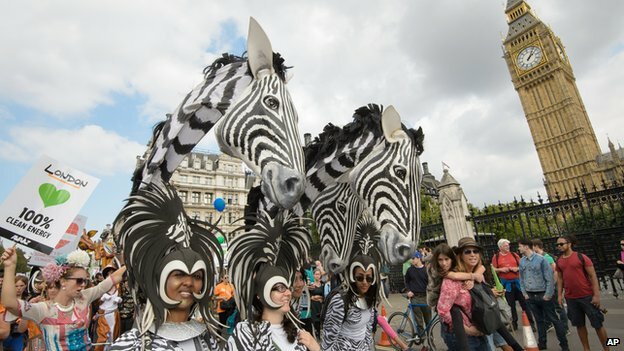 Street protests demanding urgent action on climate change have attracted hundreds of thousands of marchers in more than 2,000 locations worldwide. 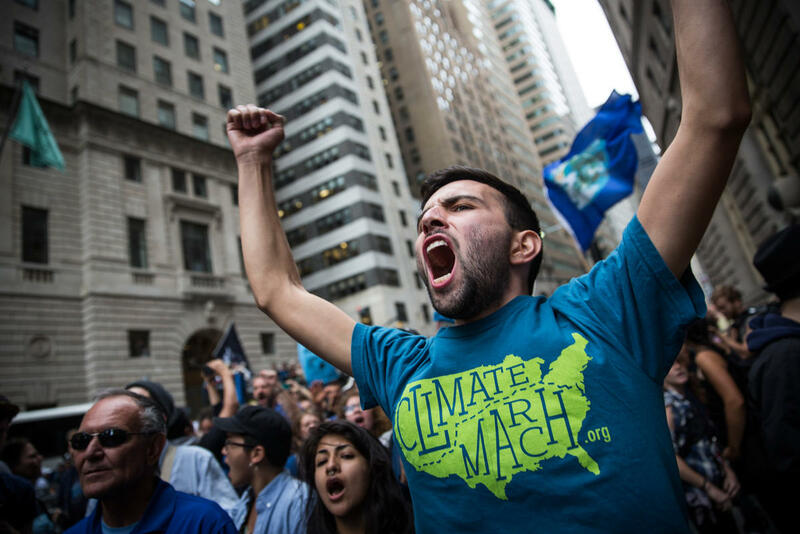 The People's Climate March is campaigning for curbs on carbon emissions, ahead of the UN climate summit in New York during September 21-26, 2014 in New York City. 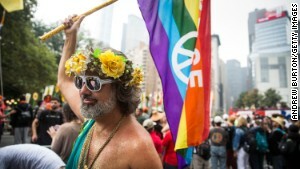 In Manhattan, 310,000 people joined a march that was also attended by UN chief Ban Ki-moon on Sunday, September 21, 2014, while also huge demonstrations took place in Australia and Europe. 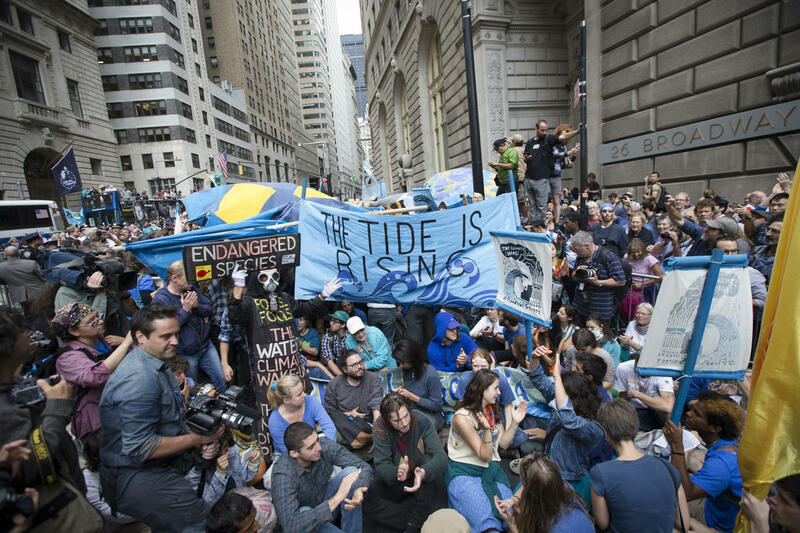 "This is the planet where our subsequent generations will live," Mr Ban told reporters. 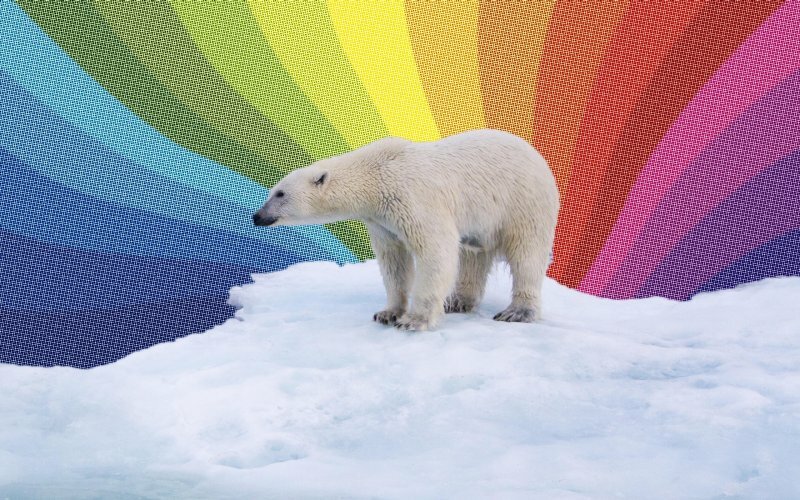 "There is no 'Plan B' because we do not have 'Planet B'." 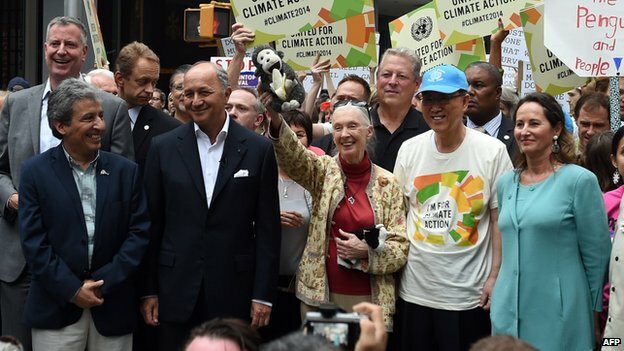 The UN Secretary General (in blue hat) was accompanied by primatologist Jane Goodall (to his right) and the French Ecology Minister, Segolene Royal. New York hosted the largest of Sunday's protests, drawing more than half of the 600,000 marchers to have taken part in rallies around the world. 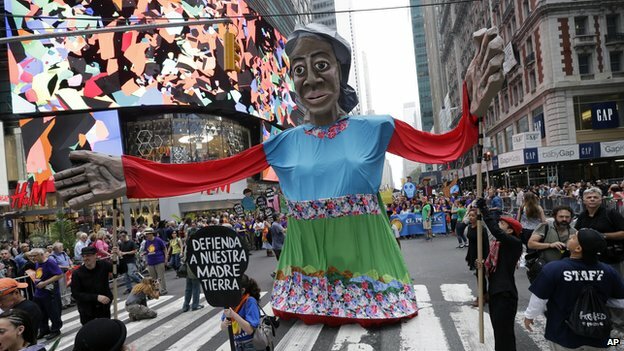 Mother Earth float making its way down 42nd Street, New York The protesters in New York used outsized floats to convey their message. 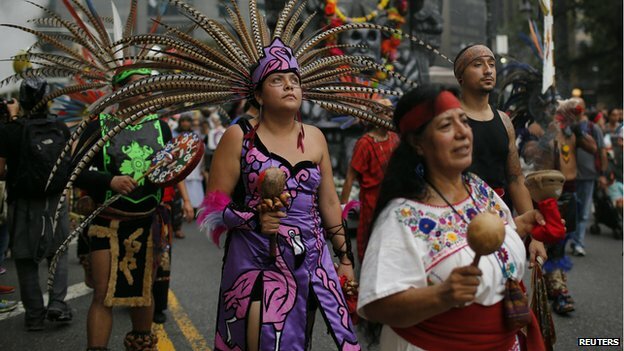 Manhattan echoed to the sound of chants, horns and drums as the colourful protest progressed through the streets. 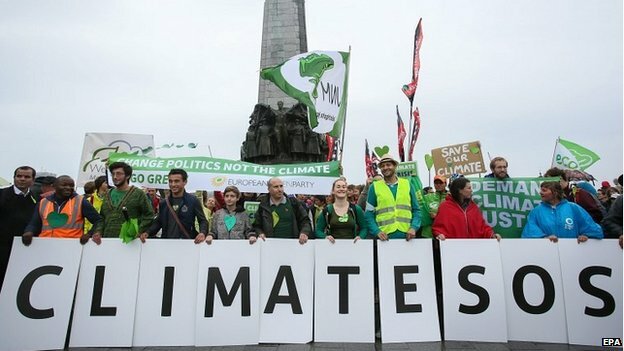 The massive mobilization was aimed at transforming climate change "from an environmental concern to an everybody issue". 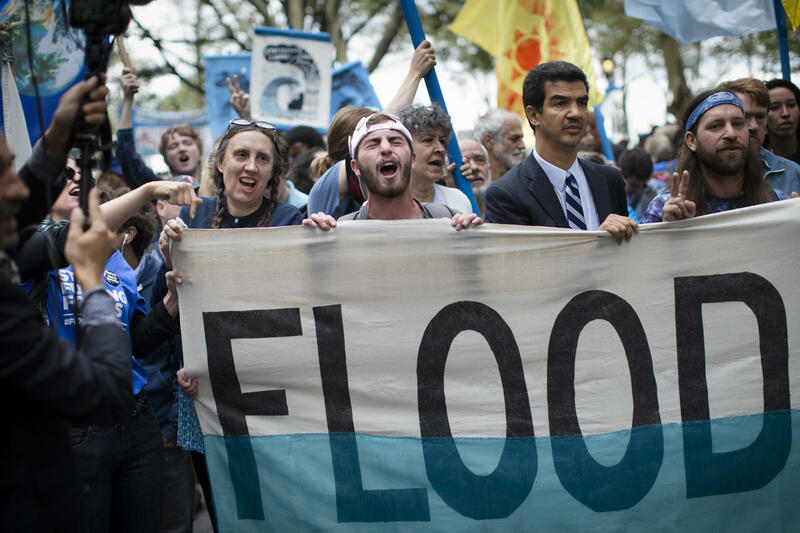 Business leaders, environmentalists and celebrities joined the demonstration. Hollywood actor Leonardo DiCaprio also took part, having been appointed as a UN representative on climate change last week. The marches brought more people on to the streets than ever before, partly thanks to the organizational power of the e-campaign group Avaaz. 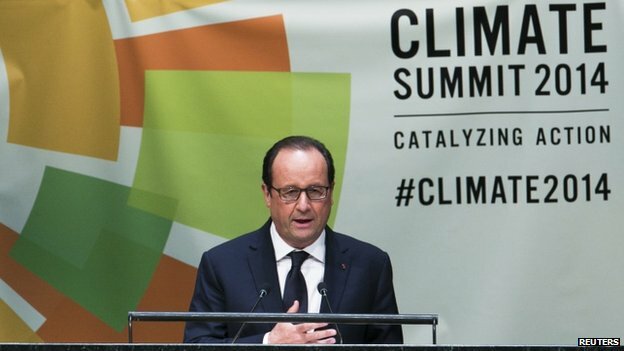 And the climate talks will also be influenced by technology, as it was recently reported that the sun and wind can often generate power as cheaply as gas in the home instead of the use of Fossil fuels. Certainly the UN's Secretary General, Ban Ki Moon, hopes that he can make a fresh start in the endless blame-your-neighbour round of climate talks. 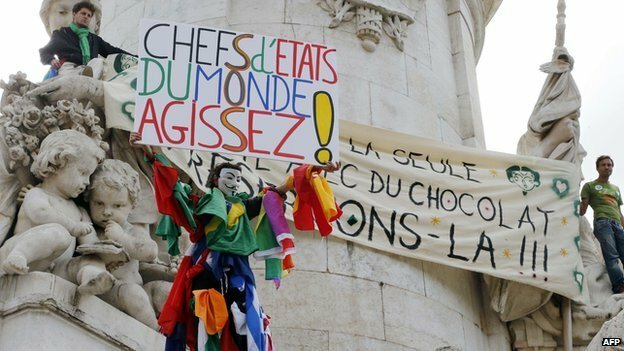 Next year world leaders are due to show up in Paris to settle a global climate deal based not on a bitterly-contested chiselling negotiation in the middle of the night, but on open co-operative offers of action to tackle a shared problem. Mr Ban has invited leaders to New York to make their offers public. 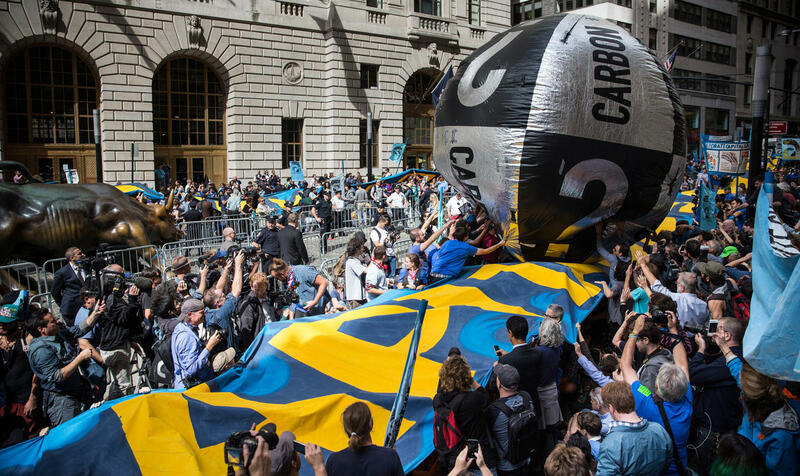 Some small nations will doubtless make new contributions to the carbon contraction effort as they realize the vulnerability of their own economies to a hotter world. But some big players may continue the game of climate poker, holding back their offers until they see what else is on the table. So there is no guarantee that Ban's idea will work - but at least for weary climate politics watchers it will be a change. 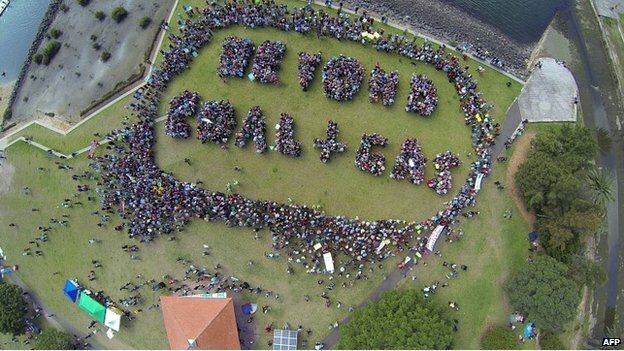 forming the Words "Beyond Coal + Gas"
Some 30,000 people marched in Melbourne, Australia. Demonstrators urged Prime Minister Tony Abbott to take action, citing fears that climate change could lead to more bushfires and droughts. Smaller protests - attracting numbers in the hundreds or low thousands - were also seen in cities such as Bogota, Barcelona, Jakarta and Delhi. 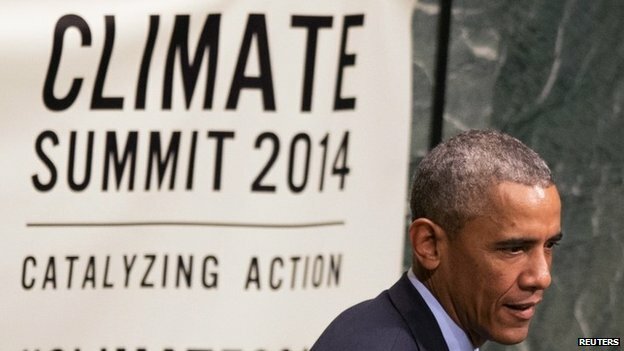 On Tuesday, September 23, 2014 and throughout the week the UN will host a climate summit at its headquarters in New York with 125 heads of state and government with the hope that a universal agreement would be signed by all nations to start implementation of the recommendations by the end of 2015.